Where: Greshams Sports and Social Club, Tuddenham Road, Ipswich, IP4 3QJ. Please join us for an Afternoon tea with Fizz at Greshams Ipswich on Friday 12th October. Hosted by Wayne Bavin and guests Maggie Oliver, Kieron Dyer and Minnie Moll. 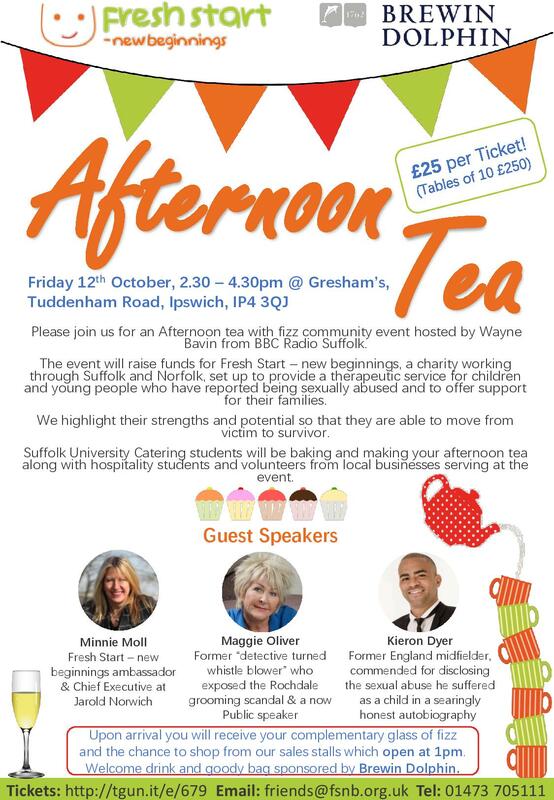 High End afternoon tea will be cooked and served by students from Suffolk New College and volunteers from local businesses who will ensure that you enjoy a delightful afternoon and that your cup is always full. The event will raise funds for Fresh Start New Beginnings.